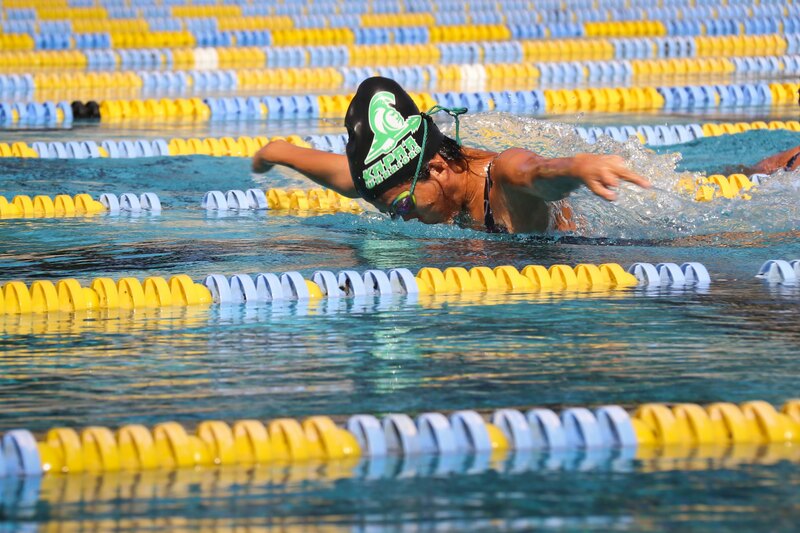 The coach’s wife took this amazing picture of YaYu flying through her 100m butterfly race in last week’s meet. When she joined the swim team four years ago she didn’t know how to dive off the starting platform, let alone swim the butterfly. We’re so proud of this girl and her effort over the past four years. And another busy week at Casa Aloha comes to a close! We’ve had dental appointments, doctor appointments, swim practices, a swim meet, a birthday, the monthly Big Shop, farmers’ markets and more going on all through the week. Next week will be only slightly better, but then hopefully after that life here will calm somewhat down for a while. I can’t tell you how much I am looking forward to a day when I can wake up and know I don’t have to be somewhere at certain time. WenYu returns to Massachusetts this week, and none of us is looking forward to her departure. Although she’s happy about being with her boyfriend again, she’s not particularly excited about classwork starting up again, and is definitely not happy the cold weather back east. Brett and I and YaYu just love having her around though – she’s such a calm, easy-going person. She’s not sure if she’ll be back next summer before we go – she’s applied for a couple of internships in Boston, and will stay back there for those if she’s chosen. It’s been dawning on me that it might be a whole year until we see her again, and on her that she might not come back to Kaua’i, or at least not for a long time. She was so against our moving here, but has come to love the island life, and now says the move is the best thing that could have happened for her. 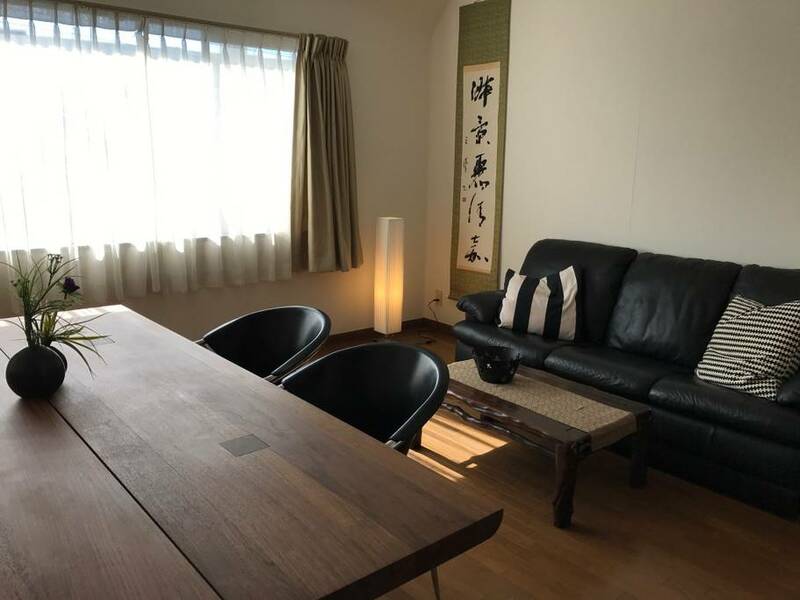 The living-dining area of the Tokyo Airbnb we’ve rented. The location is about a 20-minute walk to our son’s condo, or one subway stop away. Things continue to fall into place for the Big Adventure. This past week we were able to find and reserve a rental in Tokyo for our three-month stay in 2019! I had found a place we liked a couple of months ago, in another part of Tokyo that we’re familiar with, but when I went back to check on it the monthly cost had soared sky-high. Not sure what was up with that, but there was no way any longer we could afford the new price. I started looking for rentals nearer to our son’s new address, and found this great apartment that fits our budget (we were given a substantial discount due to the length of our stay) and had lots of great reviews. The Tokyo rental was the one we have worried about the most because of the length of time we need it, and the cost, so we are thrilled to have gotten this set up already. We are looking forward to having our grandson over for some sleepovers while we’re there, and also being close enough to babysit for the grandkids so M & M can go out for dinner, or a movie or something once in a while. Meiling is also going to come visit during her spring break, and maybe WenYu and YaYu as well. And, here’s another reminder that if you haven’t already, I hope you’ll check out and follow us on Instagram at #theoccasionalnomads. I post just a few times a week now, but plan to post daily when we begin traveling later this year! Reading: It’s been slow going with Grant’s Memoirs, not because it’s tedious, but because of the detail he has included. The only difficult part so far was when he described his service during the Mexican-American war, and the battles fought in Mexico. I have no sense of place with any of that, and several military terms and tactics went right over my head. It was interesting though to read about how many future Confederate generals he met and served with in Mexico, including Robert E. Lee. I’m able to follow along a little better when he’s writing about the Civil War – I just finished reading yesterday about his experiences during the Battle of Shiloh. Listening to: There was lots of noise outside this morning from several neighbors working on their lawns, but it’s all quieted down now, thank goodness. Brett is out taking care of the recycling, the girls are puttering around in the kitchen, and the washer and dryer are quiet for the time being. The weather is a nicer than it has been the past couple of days – the sun is shining again and there’s a nice breeze blowing through the trees. Watching: I still haven’t found anything I want to watch, but Brett has been continuing with an episode or two of The Republic of Doyle every evening while I read. Cooking/baking: I’m fixing Chinese stir-fried tomatoes and eggs for dinner tonight. We all love this dish, and I wanted to make it for WenYu before she left. Beautiful tomatoes were in abundance at the farmers’ markets so the timing is perfect. I’ll serve rice and cucumbers (also in abundance) with the tomatoes and eggs. I’m also hoping to make the olive oil orange cake this afternoon – I think I can squeeze it in. This week we’ll be having grilled fish tacos with mango salsa, grilled polish sausages with coleslaw, ravioli with pesto, and I’m trying a new recipe: Ghanian groundnut (peanut) chicken stew. I bought a big bag of riced cauliflower at Costco last week, so now can have some of that whenever everyone else is having rice. 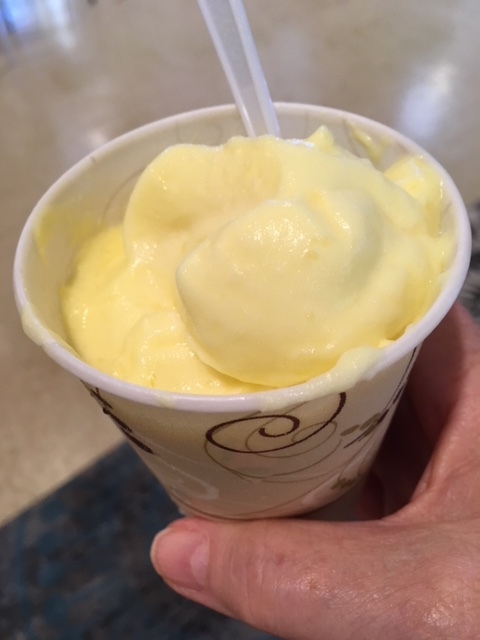 I enjoyed a pineapple frosty after my doctor’s appointment: frozen local pineapple run through a juicer so it has the consistency of ice cream. YUM! Happy I accomplished last week: It felt like we did everything this past week. I had a good check-up at the doctor’s (he was really pleased with the weight loss! ), picked up my new glasses, had a great birthday celebration with YaYu, did some more decluttering in the garage, and much more. Brett got his new hearing aids on Monday and we’ve all noticed the change. It was a somewhat tiring week overall though, but very satisfying with all we got done. Brett and I walked three miles every day but Friday and Saturday (rainy weather), I drank all my water, and I studied French for at least 10 minutes every day. I sadly didn’t get to work much in my coloring book because it was just too busy most days. Not my accomplishment other than I reread everything and checked for errors and such, but YaYu submitted the last of her college applications last Sunday evening. Now we wait, although there is still more writing coming up for scholarship applications. Looking forward to next week: I am having my annual fasting blood work done on tomorrow morning (which I’m not looking forward to), but Brett, YaYu and I are going to go for coffee at the Kilauea Bakery after that’s done. I’m getting my hair cut on Tuesday afternoon (YEAH!) – I am so excited to get rid of this big frizzy mess that’s on my head right now. Saturday will be YaYu’s final swim meet, and I know already it will be bittersweet. She’s ready to be done, but she has improved so much over the past four years, and is such a pleasure to watch swim these days (her swimming yesterday was exceptional). We couldn’t be prouder of all the effort she has put into it. All in all though I’m mainly looking forward to things beginning to slow down a bit. 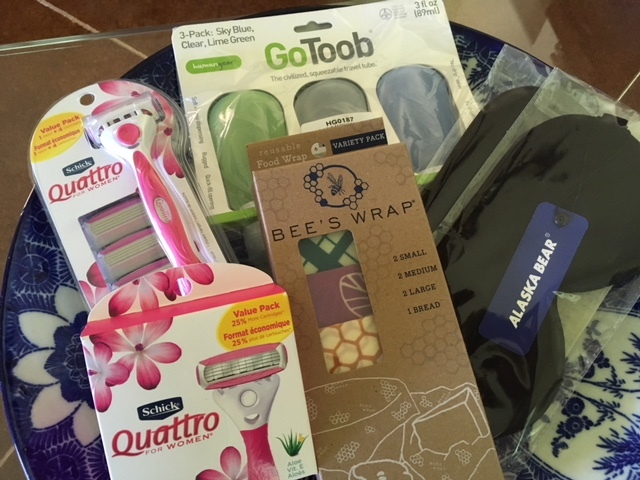 More travel goodies: New razor and blades, travel tubes, the BEST sleep masks, and Bee’s Wrap reusable food wraps. We also got a voltage converter and some packing cubes. Thinking of good things that happened: Brett and I had a nice coffee date at Java Kai on Friday and used up the gift card on a couple of smoothies. Neither of us had been for a while and enjoyed ourselves and our drinks, and I saw a couple of low-carb items on their food menu that I’d like to try before we leave the island. Finding and then actually getting a reservation for an apartment for the Tokyo part of our journey was very exciting, and a BIG relief. While I was in with the doctor last week, Brett scooted over to Banana Joe’s and got me a pineapple frosty! I prefer the banana frosties, but the pineapple one was low acid and delicious. We had a big order come from Amazon with lots of travel-related items this past week. It was like Christmas all over again! I feel though like we are getting to the end of accumulating travel things, including clothes and other accoutrement. Thinking of frugal things that we did: 1) We came in approximately $50 under budget with this month’s Big Shop; 2) We saved over $60 by booking WenYu’s flight to Honolulu a couple of hours earlier in the morning on Friday versus closer to her departure time (and she’s fine with a longer Honolulu layover); 3) Pork loin chops were $3 off per package at Costco, so we bought two packages instead of one (pork is YaYu’s favorite protein), and saved over $100 on other sale items that were on our list (including new electric toothbrushes for Brett and me); 4) We put $9.00 in the change/$1 bill jar, leftover from the farmers’ market. 5) We got a substantial “discount” on the Tokyo rental ($200+) when the exchange rate improved in our favor the day the payment posted. 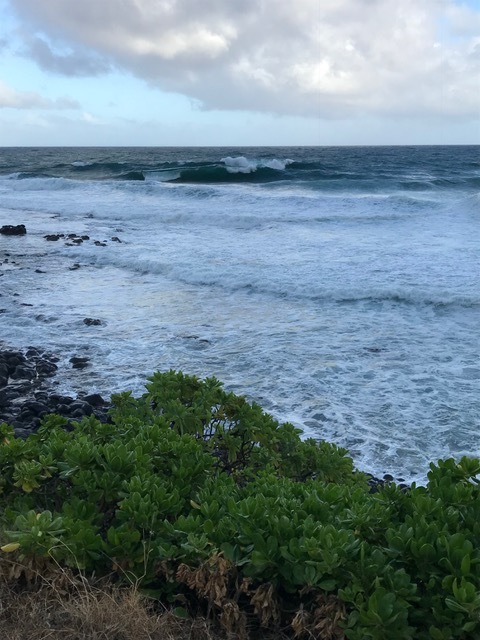 It was VERY windy last Thursday and the surf was fierce. One giant wave after another were rolling in – their roar was almost deafening. Grateful for: Brett and I walk three miles every day along the Kaua’i beach path, which runs for approximately seven miles along the east coast. The views are fantastic no matter the weather or which direction we go, and the path is wide and smooth enough to share with others whether they’re jogging or on bikes or walking like us. I’m so thankful this walking venue is available – in my own case it makes me want to get out and walk every day, and the views never disappoint. Bonus Question: Do you ever suffer from road rage? LOL – I yell at other drivers all the time . . . from the safety of my own car and with the windows rolled up. Actually, I’m pretty much a very patient driver, but now and again I get stuck behind a bad driver and get frustrated (or actually angry if they’re doing something dangerous). The one thing that gets to me more quickly than anything else is being behind someone who drives inconsistently on the open highway (speeds up, slows down, brakes for every curve, etc.). Arrrrrrrgh! It’s especially maddening because they seem to always speed up when I try to go around them. There are also occasionally tourists who get lost and just stop in the middle of the road in town – seriously! Pull over, park, go around the block but please don’t just stop and sit there while you check your GPS! Brett has a shorter fuse than I do, but he’s grown more patient the past few years, and all of his yelling is also done from inside the car. The girls think our grumbling at other people is pretty funny, but we’ve told them it’s a way to safely let off a little steam in what for us can be a frustrating situation. That’s what’s been going on here at Casa Aloha – how was your week? What did you accomplish? What are you reading? What good things happened for you? It has actually been warm here on the east coast lately. It was in the 50’s yesterday and today and is supposed to stay that way all this week! I was finally able to go out for a walk both days for the first time in a long time. So it won’t be as much of a shock for WenYu! Thanks, she will enjoy hearing that! The cold, cold weather back east is really the only thing she doesn’t like about where she goes to school. That is an amazing photo of your daughter. I would copy that one into a memory book! We are finishing up on “Travelers” on Netflix. We really enjoyed the first season. Grant’s Memoir is now on my library list- thank you! We are headed to Phoenix for some time with my mom. I am looking forward to being warm! We thought the same thing when we saw the photo – it amazing! It caught the real determination in her face too. I thought butterfly was her least favorite stroke, but she said she actually dislikes the backstroke more. Her best strokes are freestyle and breaststroke. She was on fire yesterday in her 200m breaststroke race – had everyone on their feet! The Memoirs really is interesting if you enjoy history. Grant’s attention to detail is remarkable, but when he’s describing battles I have to stop and picture where everyone is or otherwise it makes no sense. We lived fairly close to Shiloh when we were stationed at NAS Memphis, and visited the battlefield a few times. So, when he describes the battle I can picture some of the terrain that he’s desciribing (it would be the same at Gettysburg). Arizona in the winter is fantastic, and beautiful. It is warm, but very dry too. We were constantly drinking to stay hydrated. Im convinced that Republic of Doyle is a guy thing, as is the other one (name escapes right now because of my cold) about the neat freax and the casual guy who partner in london. The girls have sat in on a couple of episodes of Republic of Doyle and liked it (although not enough to watch more). The other series sounds interesting – if you remember the name let me know! I may have already seen it, but it sounds different enough that maybe I haven’t. Had our second bout of freezing weather. So unusual for Florida but temperatures warmed to 72 today (perfect). Missed my second ww meeting but am down a size in pants and my blood sugar is coming down. Crossing my fingers as I go to the Doctors next month. So glad you were able to get the rental in Tokyo, it looks super nice. It would be great if your daughters could get there spring break. I’m really getting excited about your travel plans, can’t wait to read about everything. Never been on Instagram but I will have to check it out. What is a travel tube? It sounds like your efforts with WW are paying off – congratulations! I don’t think I’m going to lose anything this month, but I haven’t gained anything either. I am hoping all the news from tomorrow’s bloodwork will be good. I’m also going to have a mammogram and bone density test, probably next week. My doctor is really excited about our trip as well, and gave me some good advice about medications to take before we go and while we travel (especially in India). The travel cubes are zippered containers that come in a variety of sizes that you can use to pack different types of items. We got three of them – one will be for socks, and the other two for underwear. They make it easy to find things in your suitcase, and with the bigger ones for shirts they can help prevent wrinkles. We are super excited about the Tokyo rental. It’s in a great neighborhood, and close to our son without being right on top of them. The kitchen is very well fitted out – there’s even a rice cooker. We may have to get a couple of things (teakettle? coffeemaker? ), but our son said we can store them at their place (they have a big storage closet) and then get them out the next time we come. We are discussing our home remodel & getting ready for taxes. Ick. That picture is amazing, and really shows her personality and determination. I know you’re going for business and would rather be home, but I’m still jealous of your trip to Tokyo. Hopefully some day you’ll be able to go for pleasure! We’re getting ready for taxes too. Ick is right. We try to figure it so we get as close to zero as possible, but we’re thinking we may have to pay this year. Can’t wait to read more about your remodel. Is your solar up yet or ??? Do people in Hawaii grow vegetables? We are on the North Shore of Oahu and I have not seen any vegetable gardens in people’s yards. It seems like the climate here would be perfect for growing them. Well, they do here on Kaua’i! I think every third house on our street has a vegetable garden. Lots of people here are from the Philippines, and besides typical vegetables they also grow speciality items that are used in Filipino cuisine. Our landlord said we could put a garden in here, and we thought about it but figured out the cost would have been prohibitive because of all the preventive stuff we’d have to install to keep the feral chickens from digging up everything. What an inspirational photo! I wish her the best of luck with her College applications. Tonight I am meeting and old friend and her family who came to Istanbul to discuss school options for her younger daughter who is a senior at HS. They will be meeting some consultants who help placement of kids at schools outside of Turkey. Her older daughter graduated from Computer Engineering this year from a college in Turkey. The little one(!) want to go to the US. Very determined young lady. Probably another engineer to be. Mom and Dad are both Electronics Engineers so, I guess it runs in the family. College consultants are apparently a real thing now, but college applications and admissions are crazy these days and very competitive, especially so if you live outside the U.S. I will be so glad when this whole college admission thing is over and done with! Great shot of YaYu! What a keepsake that is! You’ve been busy! It’s always better to be busy than bored in my world. 🙂 And that Tokyo rental looks lovely. We had a painter in last week (insurance work on a water leak that is finally all complete). It’s always odd to have a stranger in my house, even when it’s a very nice and polite person. So happy to have that guest room and bath back together with a fresh coat of paint all around. We’re at the stage of winter (cold, dark, rain lately melting all our snow) when we typically try to go to the sun. We have reservations in Jamaica with some friends next week, and I’m really looking forward to the warmth and relaxation. We’ve not done an all inclusive before, but these friends love them and have done a winter break for a long time, so when they invited us, we thought why not? It’s really reasonable, so my fingers are crossed I’ll like it. And traveling with friends…we don’t normally do that. We have been asked by one college to write our own recommendation for YaYu, and I am basing it on that photo – it expresses who she is perfectly. Your trip sounds like the perfect respite from the weather you’re having, and even after you’ve come back you’ll still have the memories. I have never visited the Caribbean, although we did live in Key West for two years. Here’s hoping you have a wonderful time! Brett has settled down considerably here. I’m happy too that other than a few days in France, and while we’re in New Zealand, neither of us will have to do any driving. I don’t think he’d last a day in some of the places we’re going. Glad to see you found the cost effective Airbnb Tokyo. Our son lives in Kyoto and it is becoming harder to find a western style (wife can’t do floor beds) place. We had a great place last year (within easy walking distance) but it stopped being an Airbnb 😦 . They live in a residential area without many attractions so we may have to get something further away. My son says they are cracking down on the Airbnb a bit as the hotels are complaining and some places where they are in apartment buildings the other residents complain about the non-residents coming in. Security worries, etc. Kyoto is a big tourist place and having too many tourists use Airbnb lodging can be a problem – more so than Tokyo I think. Thanks for this information, and it makes sense that there would be more issues with Airbnb in Kyoto than Tokyo. We stayed in a lovely 100 year-old machiya when we visited Kyoto in 2015 (via Airbnb), but I noticed the other day it’s no longer available. It was also in a residential area, had Western beds, so who knows what happened. Lots of cities/areas have been cracking down on Airbnb, mostly by requiring owners to pay high enough taxes that their rental isn’t financially viable any more. It’s just one of the reasons Airbnb does not have a big presence here on Kaua’i, although they’re trying to build the brand here. VRBO is much bigger here (at least on Kaua’i). Well we got lucky – scored a Airbnb about quarter mile from my son for $40 a night. Staying for 21 days in May for less than $1000. Western beds too! Woo, Woo. Tried VRBO as well but nothing there I can afford. As my son lives several train stops from Kyoto station and downtown where most of the Airbnb stuff is located there are slim pickin’s out in his area. Now on to plane tickets. Hi Laura, Love the swimming picture. I have been following your blog for a long time and I have had an Instagram account only recently, I have tried to join your Instagram account to look at your photos but everytime I put the hashtag address in to look at your photos, it shows cannot find this address, this the right address?. The Instagram address is theoccasionalnomads, with the three words smashed together. Maybe I got it wrong? Anyway, I hope you find it. I think it will be a fun additional way to communicate while we travel. Let me know if you still have trouble and we’ll figure it out! Also Laura if you are looking for good quality travel clothes, here in the UK we are lucky to have a company called Rohan, they do very good quality, (not cheap) travel clothing. Just thought you might like to look at them. They wash very easily and dry quickly and pack very small, I have quite alot of their clothing and I have always found them amazing. I checked out Rohan, and their stuff is gorgeous! I’m actually pretty well set for clothes right now though, but when we get to Great Britain I will be looking them up. I think for this trip I would be relying more on travel-type clothes if we were going to be moving around more quickly, but I’m hoping that by “slow traveling” and staying in places with washers (and occasionally dryers too) I’ll be able to make do with more regular-type clothing items. I’m posting about my travel clothes tomorrow, with pictures!